CSD ACTIFOAM fire resistant seals provide fire protection of cable ducts in building and industrial applications using expanding closed cell foam rubber sheets which can be sized to suit any variety of service types passing through any size wall or floor opening. ACTIFOAM fire resistant duct seals are simple to install and easy to regularly disassemble; ideal for applications where routing or re-routing of cables is common place. 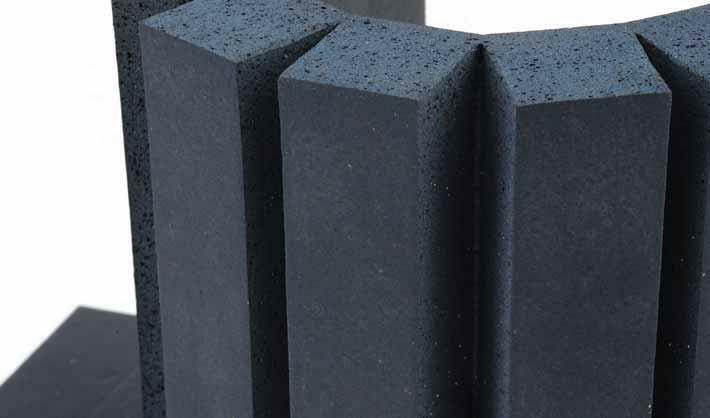 In the event of a fire the rubbers, thermoplastics and compounds used for the ACTIFOAM seal will produce such an amount of fire retardant material that major deformations or displacements in the services or structure are effectively accommodated, ensuring the penetration will remain fire-tight. 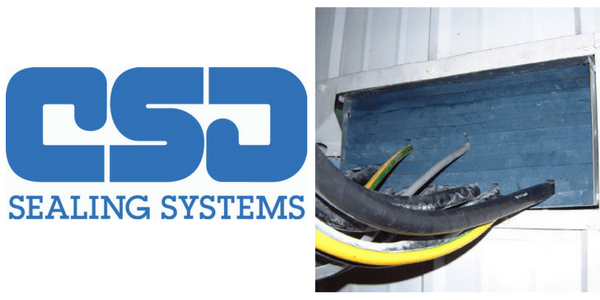 The higher the temperature, the more fire retardant material will be produced – view the complete range of CSD Sealing Systems. Step 1 – If the walls inside the conduit opening exhibit large irregularities, they should be locally smoothed with FIWA (or NOFIRNO) fireproof sealant, otherwise insufficient smoke tightness will be obtained. Step 2 – The cables can be ducted through the conduit opening in random order. It is important that they are not pulled too tight in order not to hamper their separation. Step 3 – ACTIFOAM rubber sheets are cut into strips fitting to the size of the walls inside the conduit opening. For this purpose ACTIFOAM sheets with a thickness of 25mm are used. Step 4 – The ACTIFOAM rubber sheets should fit snugly in the conduit opening to ensure a tight fit against the walls. This is important to avoid smoke penetrating between the sheets and the wall. Step 5 – An ACTIFOAM rubber sheet must also be placed in the conduit opening underneath the layer of cables. A band is placed around the cable bundle to lift the bundle of cables. Step 6 – A slightly oversized strip of ACTIFOAM rubber with a thickness of 25mm is placed inside the conduit opening underneath the cables. The sheet will be compressed by the weight of the cables. Step 7 – One layer of cables is spread out on the ACTIFOAM rubber sheet at the bottom of the conduit opening. The other cables are lifted to make room for further finishing to the first layer. Step 8 – For proper cable separation, square profiles are torn off the pre-slit ACTIFOAM rubber sheets. The sizes of the profiles should be similar to the cable diameters. Step 9 – Profiles are slit in sizes of 10×10, 15×15, 20×20 and 25x25mm. This enables an easy fit for corresponding cable sizes. Cables larger than 25mm should be separated by a minimum of 25mm. Step 10 – Adjacent to the first layer of cables and profiles, one or more extra sheets of ACTIFOAM rubber is fitted to create a level layer for further filling the conduit opening. Step 11 – An intermediate ACTIFOAM rubber sheet is inserted in the conduit opening on top of the levelled first layer. The thickness of the intermediate layer is dependent on the maximum cable diameter. Step 12 – The next layer of cables is spread out on the ACTIFOAM intermediate rubber sheet. As indicated before, the cables should not be pulled too tight to enable this. Step 13 – In the same way as with the first layer of cables, the cables are separated with the ACTIFOAM pre-slit profiles and levelled with one or more ACTIFOAM sheets. Step 14 – The remaining space is filled with one or more ACTIFOAM sheets. All sheets should fit tightly in the conduit opening to obtain a fair degree of smoke tightness. Step 15 – Due to better sliding of greased rubber on rubber and for final finishing, an ACTIFOAM sheet must be inserted between the top layers of ACTIFOAM sheets. Step 16 – Compression of the filling is necessary to obtain stability. For this purpose it is easier to insert a couple of strips instead of sheets. The strips are greased all around with CSD lubricant. Step 17 – The first strip is inserted into the opening between the layers by hand. For a wall thickness of 150mm, it is advisable to cut three strips 50mm wide to enable easier insertion. Step 18 – A piece of wood is used to push the strips tightly into the opening between the ACTIFOAM rubber sheets. The use of strips instead of sheets makes this much easier to do. Step 19 – The finished ACTIFOAM multi-cable penetration. Officially fire tested according to BSEN 1366-3 (NEN 6069) for 2 hours in an aerated concrete wall 150mm thick. Step 20 – In case the penetration has to be not only fire safe but also gas and watertight, the ACTIFOAM foam rubber filling can be covered with a layer of FIWA (or NOFIRNO) sealant in a minimum thickness of 10mm. Step 21 – It is not necessary to interrupt the cable tray. ACTIFOAM allows, if required, the tray to be passed through the conduit opening. ACTIFOAM sheets are placed around the cable tray.